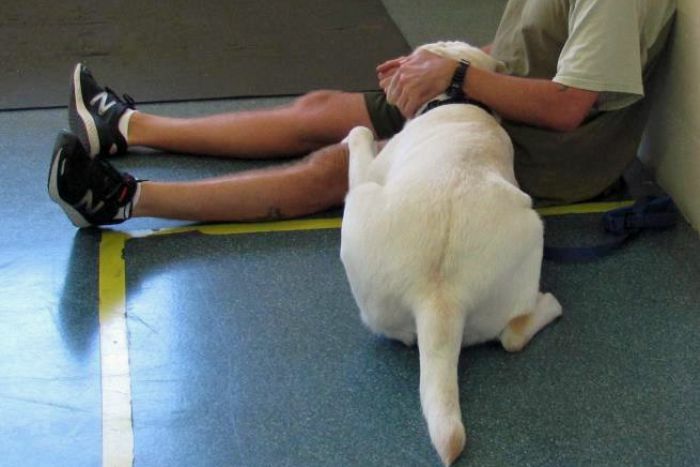 It would appear to be the most unlikely source of dog trainers but a pilot program in Queensland has had overwhelming success with inmates training special needs assistance dogs. 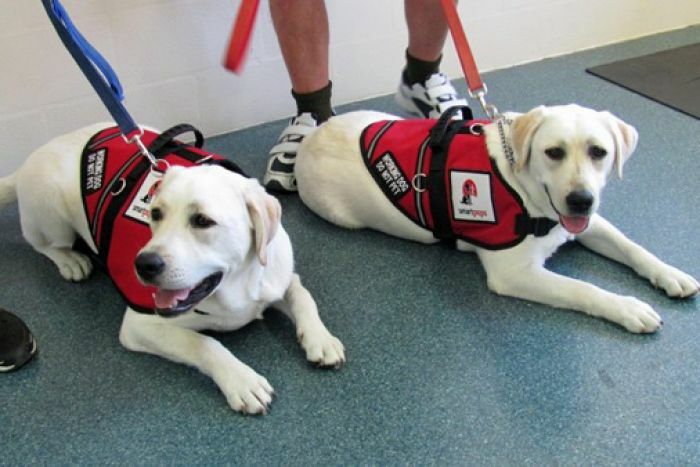 Dogs Hank and Hope were the first of six graduates from the pilot program at the Maryborough Correctional Centre, about 250kms north of Brisbane. The pair arrived at the centre in May last year where they were trained by carefully selected prisoners in the facility’s residence area, not the high security section. Over 10 months, the prisoners taught the dogs complex tasks including wheelchair work, opening doors, picking up dropped items and turning on lights, all to prepare them for life with a special needs child. CEO of Sunshine Coast-based Smart Pups, Patricia McAlister, said the pilot program had been very successful as the increasing demand for trained dogs was “huge” and outweighed the number of assistance dogs available. “They’ve been doing a terrific job. It’s definitely a win-win,” Ms McAlister said. “They have their general obedience and they’re trained for public access work and then they’re trained to be task-specific to whatever will help make the child more independent. “We have our autism assist dogs which are trained to disrupt meltdowns, to track the children if they’re missing, to act as an anchor if the child is going to be tethered to the dog. Smart Pups also trains dogs for diabetics and mobility assistance and seizure response dogs which can alert of a seizure about 10 minutes before it happens. “We’ve also placed a dog with a returned veteran with post traumatic stress disorder,” she said. Ms McAlister said it cost up to $30,000 to buy, train and place a dog, depending on the complexity of tasks required and Smart Pups does not receive government funding. In 2016, 25 dogs were placed with families around Australia, but in 2017 that was expected to increase to 35. She said it took hundreds of hours to train the dogs, and the inmates had the time to spend on training the more complex tasks. Ms McAlister said the inmate program could help the group tackle its ever-growing waiting list. “We’ve got about 60 families that are waiting and we get more applicants every week,” she said. Two of those families have been on the waiting list for two years are about to receive their new additions — Hank and Hope. Ms McAlister said the dogs would each be sent to homes with children on the autism spectrum. Hank has been sent to his family, while Hope will arrive at her new home in coming weeks. “Hope is helping a little girl who’s also in a wheelchair,” Ms McAlister said. “[She] will help in a lot of ways like taking off shoes, taking off a jacket, opening doors, turning on lights so she has quite a lot of tasks. A spokesman for Queensland Corrective Services agreed that the program has had a positive impact on the prisoners involved. “The general benefits include better communication, improved self-esteem and greater empathy,” the spokesman said. News of the dogs being sent to their new families has been satisfying for the prisoners. “One prisoner, a middle aged father, said he would love to think that a similar program would be available to benefit one of his children if ever they needed it. Ms McAlister said training a dog inside an institutional facility brought challenges. “The dogs aren’t let out until later in the day so we have to train the dogs to pee on artificial grass in the prison’s bathrooms,” she said. “They’re not actually let out until about 8.30 in the morning and it’s too long for the dogs not to be able to go to the bathroom. “The dogs, when we bring them out, they’re really keen when they see long-bearded, tattooed-type men. “They wag their tails and they’re buddies, so they’re really relaxed around men. Now that Hank and Hope have moved onto their new life, four puppies remain in training at the Maryborough Correctional Centre. Ms McAlister said two will graduate in June and another two later in the year while there are hopes more will follow in their ‘pawsteps’ given the success of the program. “We’ve really enjoyed working with the guys in there,” she said, adding that she would like to see it rolled out in other Queensland prisons. A young boy’s autism assistance dog has been banned from his public school classroom because of the health risk animal hair poses to other children. Parent Jodie Davidson says labrador Cobolt has made the world of difference to her son Aiden, 7, a Year 2 student at O’Sullivan Beach School, since the dog became part of their family about 18 months ago. Cobolt helps Aiden stay calm and protects him in dangerous places such as shopping centre carparks. The Davidsons, whose other son Mitchell, 9, also has autism, say they often take Cobolt on to school grounds for a few minutes in the morning to help Aiden settle in for the day. While an initial agreement with the school was for Cobolt not to enter buildings, Mrs Davidson said Aiden had since “found his voice” and repeatedly asked if the dog could come into the classroom. Jodie Davidson and son Aiden and his assistance dog Cobolt, who has been barred from entering class. She said after the school denied the family’s requests, she decided to “push the boundaries” by taking Cobolt into class for the first time last Friday when Aiden refused to go to school otherwise. “We were in Aiden’s classroom for about seven minutes. The kids loved him. It was hunky dory and we walked out,” she said. Later that day, the Davidsons received a letter from the school saying its anaphylaxis and allergy policy “clearly states that animal hair can be a trigger for this”, so parents should not bring animals into school buildings. Mrs Davidson said it was “like they are trying to treat (Cobolt) like an average Joe Blow dog off the street”, adding teachers were now “guarding the building” so the dog could not get in. She said the school had compromised last year by allowing Cobolt into the office area, but that had not worked because other students assumed Aiden was in trouble because he was always seen in the office. An Education Department spokeswoman said schools “must consider the needs of all students to keep children safe and well”, and the agreement with the Davidsons “also takes into account the medical condition of another peer”. She said the school would keep working with the family “to ensure the agreement reflects (Aiden’s) needs, while ensuring a safe environment is maintained for other students”. Cobolt, 5, was trained by the Labs ‘n Life organisation, partly through programs run in other schools where children work closely with dogs, including in classrooms. Labs ‘n Life senior manager Sue Dansie said a compromise solution was needed, such as allowing Cobolt to come as far as the classroom door.